Happy Bloggers Challenge Friday! This week I gave the Bloggers Challenge Players the color challenge of Red, White and Blue, if you'd like to play along, just leave a direct link to your blog/gallery in the comments. I used the Mono Dies Background from the TJNL to create the stars background, using the Cuttlebug Stars Folder and the small Star Punch. 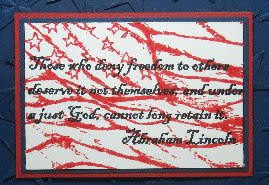 The images are both from Our Daily Bread Designs God Bless America set. The sentiment is stamped in Black, then I added the Flag using Ranger Distress Ink in Barn Red. Looking for more inspiration using these colors, click on the Bloggers Challenge Logo on my sidebar. The texture of your background is so wonderful and really makes the sentiment stand out! Gorgeous! Happy Memorial Day!!! These are just FAB GF! Wow, great background and wonderful sentiment. So true! Perfect for this weekend of remembrance for those who have fought for our freedom. The sentiment is so appropriate for this weekend! Love the background. Wonderful card for the Memorial Holiday!! Fabulous card and so Patriotic! Happy Memorial Day, Lisa! Wonderful card with a great message. Love your background technique. This is fab--I love anything that honors our soldiers! Anything with the military touches my heart--love this card:) Happy Memorial Weekend! For my money, this is one awesome card -- I love everything about it! The stars in the background are perfect but the focal image is unbelieveable! Awesome card. Great sentiment. Love the background with the stamped flag. Gorgeous card, the background really POPS! The textured background really makes this card! Just lovely! Nicely done! Have a great weekend! I LOVE the embossed stars in the backgroud--they really are the icing on the cake! GREAT job. Awesome cards, Lisa...love both of them! A perfect sentiment! Great card! 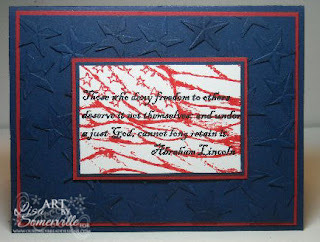 It is wonderful, I love the embossed stars and the red and white background for your phrase! Love that background! Great card!